This magnificent poetic prose is often read without providing any context. However, context is what makes this Psalm ring with hope. The authorship of this Psalm is claimed by King David, who once was a shepherd himself. Tradition holds to the idea that it was written in one of the most difficult seasons of his life. His nation and people were at war with one another. Civil war is traumatic in any form, but this civil war carried its own deep level of agony. He was at war with his son, Absalom. The words of this Psalm came from an exhausted, humiliated, betrayed and heartbroken king and father. In his darkest day, David remembered God as Shepherd. A shepherd who knows and cares for his sheep. A shepherd who would lead his sheep to good pasture and clean water. A shepherd who would protect his sheep against their enemies. A shepherd who would carry the young and risk his life to rescue those who have wandered into precarious spaces. 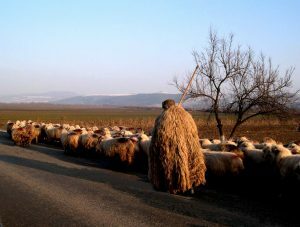 A shepherd who inspected each sheep as they entered the fold at night to ensure they had no cuts that needed tending. A shepherd who had a horn filled with olive oil and cedar tar for scratches and pests. As a shepherd, David knew what it was to love and care for his sheep. 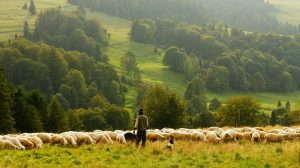 In his hour of peril, he reflected on God being such a shepherd. In some of my darkest moments, I think of David, huddled around a fire, tears streaming down his face, composing his beautiful poem. I think of my African friends who tended their sheep with such compassion. I think of Jesus, whose life and death, whose words of mercy and non-violent subversion, forever altered my life. 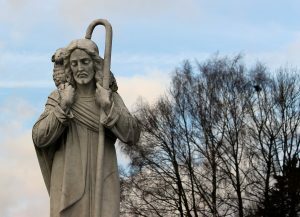 This Jesus who identifies himself as the Good Shepherd. This Psalm speaks in so many ways to me as I have struggled over the last two years particularly in relationship with one of my children. I have also been working with Asylum Seekers who have been in and out of detention in the hope of getting a permanent visa and escaping persecution. These are mainly middle eastern men who cling to hope and this Psalm resinates with them. I was also wondering if you would pray for my friend Akbar who spent a year in detention and his wife and daughter who escaped persecution and are now in Malaysia. I pray that they will be reunited. If ever you are in Melbourne, I would love you to come and speak at our church, but if you would rather avoid us homosapiens and escapevto your own space then I understand. Thanks so much for sharing, Barry. Of course I will join you in prayer for your friend Akbar. I will be in Melbourne at the end of the year – it would be my privilege to catch up with you and/or speak at your church.